All classes are taught in French as much as possible depending on the skill level of the students. Students are encouraged to express themselves in French and receive lots of positive feedback. Mistakes are corrected as much as possible in a constructive way. Assistance and encouragement are provided to keep the flow of conversation going as much as possible. There is a limit of 9 students per class for each section. Please check if there is a place available before registering. Most classes start with homework review or a dictée. All homework is optional. Sometimes a new grammar topic is introduced with practical examples and hands-on activities. The group reads, views or listens to current event pieces and the vocabulary is reinforced through conversation. Everyone is encouraged but never forced to participate or express opinions. Topics vary and are chosen to fit the interest of the group attending. All classes are two hours long and are taught at 185 Pearson Avenue. Fill in the registration form online. Provide a postdated payment for $200, dated April 2, 2019 and send it to Lieve before that date or drop it off at the registration coffee Chez Lieve on April 2nd 2019. Classes start the week of April 9, 2019. Returning students will be given priority as long as they register before April 2, 2019 and leave a payment before then. The cost for an 8 session class series (+ La Sortie) is $200 to be paid at registration. Alternatively, you can send an email transfer or pay in cash. Thank you for being prompt with your registration and payment. It allows me to know exactly how many students are committed to each group so I know how many new students I can accept. It's so easy to register!! Please fill out the form ASAP and Lieve will contact you shortly to confirm your registration. Don't forget to send your payment as well. New students should contact Lieve to check if there are any spaces available in the class they wish to register for. Fees cannot be refunded once the class starts. If you miss a class, you are welcome to take a makeup class at a similar level during the same season as the one you registered for. You may email Lieve to receive the assigned homework for the week you missed if it is available. There are 4 different levels: Low Intermediate, Intermediate, Intermediate + and Advanced. You are a Low Intermediate student if you know how to explain in French the way to get to your house with hesitation but you are able get the message across if necessary. You still make lots of mistakes but you are someone who can get that message out. Intermediate and Intermediate + students speak French with some mistakes and often have to look for their words, but have a solid grammar base but limited vocabulary. Advanced students can speak in full sentences and have experience speaking French in all kinds of situations but may be rusty or in need of keeping up the conversations fluently. 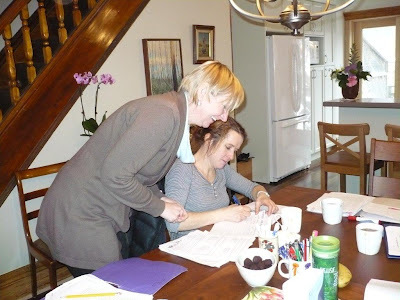 You can also register for private French lessons at your own level. Times and hourly rates upon request. Please contact Lieve or call 416 516 0197.